Find My Workspace lists over 95% of the serviced offices market in Ankara. Simply click Request Quote to check pricing for one office, or Add to Basket for multiple offices. This centre is located in Söğütözü, Ankara’s most prestigious commercial location, features 160m² of elegant welcoming lobby, 24/7 security and underground secure car parking services, magnetic card door and lift access as well as technical services, cleaning and secretarial services. This space appeals to those who desire prestigious executive serviced office space. In order to let you focus on your business this centre provides “all inclusive” office spaces for you. Offers fully furnished offices in the following sizes; 20m², 15m², 12m², 11m² and 10m² with prices ranging between $500 and $1200 USD per month. This centre is strategically located in an exceptional high-rise business tower at the crossroads of the old and the new city. The uniquely oval-shaped building is particularly eye-catching at night when it’s lit up against the skyline. From its position on floors 11, 12 and 14, some of the centre’s workspace includes views over the city. The 20-storey tower is home to a wide variety of businesses including reputable companies specialising in accountancy, management, media and energy. The centre is close to all ministry departments, universities and techno/cyber parks. The country’s economy has diversified from agriculture, textiles and clothing to include new technologies, defence, vehicle manufacturing, medical and oil and gas. Among the many businesses close to the centre are those specialising in precision glass engineering, renewable energy and industrial plant manufacturing. The centre is easily accessible as it’s close to the bus station and only 10 minutes from the city centre. The centre is in the former TV8 building, an impressive location surrounded by consulates, parliamentary buildings and landmark hotels. You will benefit from unlimited high-speed Internet to keep you connected, 24-hour access and views over Ankara’s most historic district from the fifth and sixth floor. Built to modern European standards in 2006, the six-storey building is extremely well designed and insulated. 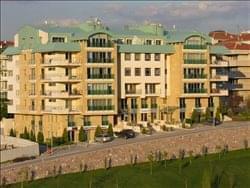 It is located opposite a park, overlooks downtown Ankara and has no obstructions on either side. All offices are carpeted, centrally heated and have individually controlled air conditioners. The offices are furnished with modern furniture and have under floor electrical and Wi-Fi connections. The single conference room is fitted with an overhead digital projector, a retractable screen and white board. The offices are fully supported by multi-lingual staff from 0830 to 1800 hrs, Monday to Friday and accessible 24 hours daily. 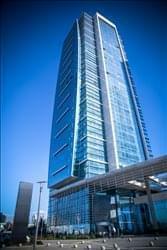 This centre offers readily available office space in one of the most luxurious hotels in Ankara. Its prestigious address, furnished offices, secretarial support and luxurious meeting rooms provide all the amenities expected of an office. You can organize your events and seminars in the impressive meeting and conference halls within the hotel which are sure to add luxury and class to any business meeting. There are private, co-working and virtual office options ensuring this is sure to make a great business base no matter your individual requirements are. Other benefits include comfortable lounge and reception areas, kitchen, cleaner, air-conditioning, car parking and unlimited tea and coffee. This business centre is a fully furnished and state-of-the-art installation, complete with high quality equipment and facilities available for tenants on-site as part of a range of occupancy packages offering flexibility, value and exceptionally professional standards. The building is a contemporary and luxurious construction situated in a prestigious corporate setting, vibrant location and complete with modern interiors and provided facilities. Such services include secure parking, dedicated telephony network, technical and administrative support, comfortable breakout and lounge areas, open plan layouts and videoconferencing capabilities. This centre offers internal and external offices with workplace and virtual office solutions. This centre offers views of an internal garden and has modern offices with floor to ceiling windows. Here, your business will surely benefit from the centre’s 24 hour access and 24 hour security, so you can work at whatever time you please with peace of mind. In addition, there is administrative support and IT support on-site who are happy to assist your company, ensuring you stay well connected at all times for maximum efficiency. There is a secure parking facility available on-site for you and your clients. Along the axis of the Eskişehir Road, an important commercial centre of Ankara, this tower is an office building targeted as the symbol of the city. This stunning building is immaculately presented and has modern decor throughout. Here, you have flexibility with the choice of shared, private and even virtual office options ensuring your individual requirements will be always be fulfilled. This is a very secure place of work with 24-hour security and there is an on-site management team who are there to ensure you and your clients have no problem throughout the working days. Other benefits include an office cleaner, communal kitchen, receptionist, photocopy, fax and printing services. This business centre provides luxurious, high quality office space within one of the most prestigious and widely desired business areas in all of Ankara. Ideal for any type of professional client with an office or workspace requirement, this building offers the very latest and most state-of-the-art technological facilities and equipment available; all within a diverse and exciting central city location. On-site facilities provided at the site include air conditioning, secure parking provision, 24-hour access, management and support teams, high speed internet and access to other affiliated centres nationwide. Ankara - Ufuk Üniversitesi Cad. This business centre is located in a Class A building project located in the centre of Ankara’s leading investment and living space. It adds innovation to the business world of Ankara through its 28-floor business tower equipped with the latest technology and made up of two parts, called tower and plinth, as well as its impressive architectural design. The business centre aims to meet clients’ corporate needs by offering services in a very prestigious destination with multiple transportation options, either in ready-to-use offices or virtual offices. The business centre is located on the 23rd floor and also has meeting rooms that can accommodate up to 60 people on the 18th floor. To obtain information for your selected Ankara Serviced Offices, please tick the "Add to basket" box for each office you prefer and complete the form below. We will then send a detailed report via email.